Born in 1996 is a bay mare and 15.1hh. She has joined the team recently and so far has a preference for the quieter rider. She enjoys her walks down the lane. This handsome chestnut gelding born in 1990 is 14hh, an active pony with a bouncy trot. With lots of year's service to the RDA, he does know every trick in the book though, so helpers beware! Domino with the designer spiked mane is 12.2hh and was born in 1998. This piebald gelding is happy to ride out or in the school. He walks out quite fast and enjoys being at the front. He doesn’t always like the noisier/fidgety riders but that can depend on what mood he’s in!! 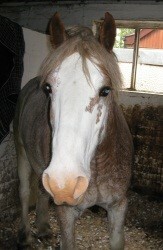 Drummer was born in 1997 is a handsome piebald gelding and is 15.3hh. He is a very consistent horse and his width (a lot of it!) means he is able to assist many riders with developing their balance. He has been driven, is ‘pigeon toed’, and doesn’t like the flies!! 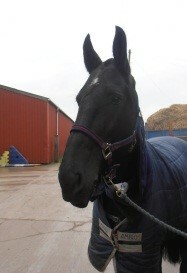 Flossie is a black mare and 15.3hh. Born in 2001. She is a new addition to the team and does like to look around and see what’s going on whilst working! She has driven in the past and likes to carry her head higher than the rest! Grace is a 15.2hh bay mare born in 1991. She is a gentle lady, who knows that her job is to look after her riders! She likes a quiet life but especially enjoys her walks out, but at her pace! Linford is a bay gelding and was born in 1997. Due to his 17.1 height he is not suitable for all riders. 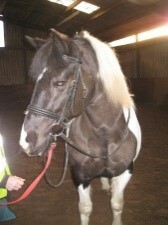 Manuel a black gelding born in 1994 is 13.2hh. In general he has a quiet character and doesn’t over exert himself! He can be very patient with his riders but likes his side walker’s to be in the correct place! Merlin is a cheeky chap with an active, but a bit unusual gait in trot, which does make him a little bouncy. He can be quiet at times, but can also be enthusiastic too. He is very understanding of his more difficult riders and can have unlimited patience with his fidgeting ones! He was born in 1999 and is 13hh. Millie is a dark brown mare and 14.2hh. Millie was born in 1992. She is a mature lady who has been there, done that and got the t-shirt! Although new to the team she looks like she’s done the job for years! Born in 2004, she is a 13.3hh black mare. Now into her second year of RDA work, she has become a popular member of the team with a quiet and patient character. She likes walking out and quiet often takes the lead. Peanut was born 1993 and is 13.2hh. A very round pony, who thinks that life revolves around food, so watch out when he spots something that might be edible! He likes to be the boss and his moods do change with the seasons, so quite often can be a “part time” RDA pony, depending what he feels like! He has the most comfortable trot though and can take small adults or children. 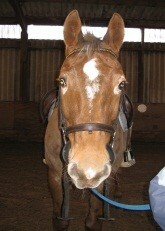 Sparky is a 16.1hh blanket appaloosa gelding born in 1999. Having spent his previous life enjoying a show jumper’s lifestyle, he is enjoying his second career as a riding school and RDA horse. He’s very patient, steady and slightly narrower than some. He has limited vision so can move his head around a bit to get a better look at things. Will set a good pace when put in the lead! Spice was born in 1999 she’s a 14.1hh piebald mare. She is as broad as she is tall! She prefers the quieter riders and has a ‘mobile’ lip whilst working! 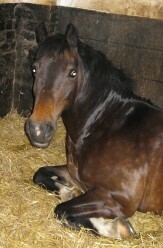 Storm is a Bay Mare 15.2hh and born in 1999. A broad lady with plenty of width, which helps with rider’s balance, without being overly tall! She’s very pretty with a long flowing mane. She’s enthusiastic about her work, but is very patient and careful with her riders.